It's funny how life takes shape, how we end up on paths that we never intended, but which come to feel deeply right to us nevertheless. When I began this blog, it was mostly about figuring out how to pay off the mortgage as quickly as possible, with a vaguely defined notion of financial independence at the end of that road. Any technique that saved money, which could then be put towards an extra principle payment, was worth considering. We started changing our habits, and kept changing them, and bit by bit those changes added up to a pretty radical lifestyle overhaul. Along the way though, other things began to motivate me. I'd always considered myself an "environmentalist," even when my behaviors weren't particularly worthy of the name. "Green" and frugal go together quite often, so it was easy for that to become more of a priority in my life. And then the whole issue of social justice came in - using our fair share of the world's remaining resources and doing as little damage as possible. Self-sufficient lifestyles have also always had my admiration. My frugal journey became heavily flavored with homesteading elements, such that I now feel justified (albeit a little shy) in calling our suburban residential lot a homestead, or at least a budding homestead. Then there's the elephant in the living room. I believe that we are headed into a future of increasingly expensive and scarce energy. I believe that more people in my country will have to do more for themselves than we have recently been accustomed to, that many things we now take for granted will become luxuries few can afford. There are plenty of people who discuss these things with more knowledge and eloquence than I can. Read them. But there's a little piece of the puzzle that I might - just might - have a corner on. Not that I've figured it all out, but I think I have a chance of helping to answer an important question. Our property technically exists in a suburb, even though it doesn't look like what you think of as a typical suburb. For one thing, our house is 130 years old, and in a tiny little neighborhood of similarly aged homes surrounded by much newer development. Our lot is 2/3 of an acre. By comparison, those newer developments consist of larger parcels. Like I said, not a typical suburb. In this part of Pennsylvania, recent zoning codes were written with low-density development in mind. So new construction happened on lots of at least an acre, and often more than that. Our own parcel was established decades ago, and left with less land. The average suburbanite across the US would think our property large, but in our area it's significantly smaller than average. So here's the question in my mind: I want to know how much food this 2/3 acre residential parcel can produce. We harvested 600 pounds of fruit and vegetables, plus 458 chicken eggs in 2009. Not only has it been a bad year for crops, but we had a backyard flock for only 8 months out of 12. We also had no yields at all from half a dozen perennial species that are planted but not yet in production. I wasn't particularly diligent about succession planting, season extension, or efficient use of the garden space we already have cleared. Nor have we yet used all the available space on our property that could be turned to food production. How much will we harvest in two, five, or ten years as our fruit trees, berries, and grapes begin to produce, as our experience grows, and we make more efficient use of the available space? I'll take a wild guess and say I think 1200 pounds sounds completely achievable to me. As a more ambitious goal, I would aim for a 2000 pound tally or even more. That would be in addition to eggs and, I hope soon, honey. Admittedly, those yields take for granted the good precipitation and high quality soils of our area, as well as the fact that one able-bodied adult makes this food production a very high priority, with occasional help from a second healthy able adult. But I anticipate that my experience is going to be of most interest to those in my area anyway, so these pre-conditions aren't much of an issue. This question of how much food can be produced from a suburban backyard isn't just a personal lark for me. I'll admit, I'm curious and I will derive great satisfaction each year that we show an increase in our harvest tally. But I believe that the answers I collect over the next few years are going to be very important sooner or later. Those of us looking to a future beyond peak oil know that food production and perhaps more importantly, food distribution, are going to be a huge crisis. We need to begin feeding ourselves more locally, and not just as a trendy lifestyle choice. Locavorism is going to become a given, not an option. If my community doesn't know what's possible on our residential lots, then we will be poorly equipped to make plans for our own needs. There are small scale farmers doing what they can with parcels of 5, 10, or 20 acres. There are urban farmers maxing out production in tiny spaces. And there are many hobby gardeners with modest vegetable plots. There are some consciously working towards sustainable food security, and others gaining gardening skills without any such goal in mind. But very little of the prime farmland that was converted into suburban sprawl is being used as well as it will one day need to be used. There's also an important difference between urban spaces occupied largely by renters, and the suburbs largely occupied by homeowners - however heavily mortgaged those properties may be. It's not the size of their properties. Homeowners, broadly speaking, are more fixed in their residences than renters, and likely to become only more so. That means there's a better return on investment for the expense and effort of planting perennial food plants such as asparagus, fruit trees, nut trees, and berries, among many others. These plants give yields for years and even decades, but not immediately. If you don't think you'll be in the same place two years from now, only a Johnny Appleseed altruism will motivate you to plant these crops. And those perennial crops are going to be important to us one day. I've already got one year of data showing harvest quantities on my property. I'm in a position to continue documenting how much food can be produced on a small piece of residential land in zone 6a by able-bodied adults with no background in farming. And that's exactly what I'm going to do as our perennials come "on-line." I'm going to push hard to make those numbers as high as possible while still maintaining good soil fertility in a sustainable system. I believe the answers I come up with will be extremely important for my area. But my findings won't necessarily be relevant to a property in Mississippi, or the Pacific northwest, or New Zealand. They won't say much about what might be achievable for an elderly person living alone, nor for a family with four children of an age to pitch in. Your area is going to need answers just as much as any other. So why not join me in documenting what is possible in your area, with your abilities, on your property? A few weeks back an ice storm and temperatures falling below freezing overnight finally gave us the nudge we needed to finish up the modifications to the shed to house the girls for the next few months. I don't like keeping them inside round the clock, but I also don't want them to get frostbite and suffer needlessly. Fortunately, we're experimenting with the deep litter method for their confinement, and they seem to like it so far. The basic idea with deep litter is that if chickens are kept on bedding both sufficiently deep (12" is the rule of thumb), and sufficiently spacious (at least 4 square feet per chicken), and if the litter is "inoculated" with living soil organisms, the bedding will be able to absorb the manure the hens produce without ever turning foul, if you'll pardon the pun. Ideally such an arrangement would happen directly on healthy soil. Since I didn't have that option, I put a tarp down in my shed and added soil from my garden to a depth of 2". So far I've added about 9" of mulch on top of the soil. (I need to add more soon to handle the manure output and get the litter to a total of 12" of depth. 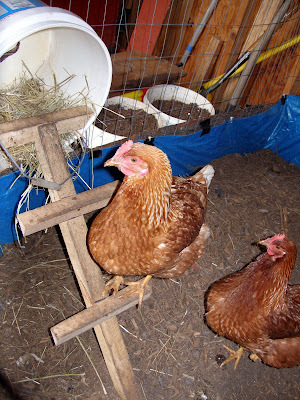 I figure since my stocking density is more generous than 4 square feet per hen, I have some leeway.) Around the tarp is a 5' x 6' framework of garden caging to keep the girls confined. They each have 7.5 square feet of floor space, or exactly as much as they have in their mobile pen during the rest of the year. They were initially quite intrigued by the looseness of the mulch, and they scratched happily at it for far longer than they do with either garden soil or lawn turf. When it's frozen, they can't scratch it, so I go in there with a pitchfork every once in a while and turn things over for them. Then they get to scratching again. I also throw some of their feed directly on the mulch from time to time so that they have additional motivation to scratch through it and keep the mulch aerated and loose. Our shed has electricity but no heat. We rigged the fluorescent lights up on a timer, which comes on around 2 am to provide sufficient hours of light to keep the girls laying. It shuts off as the sun comes up, about the time I'm out there with their breakfast and fresh water. On really wet and miserably cold days I keep the shed doors closed and light them with a single CF bulb. If I left the shed doors open on rainy days, the rain would get in and rot the flooring. On better days I can latch the double doors in a fully open position so the girls get lots of fresh air and indirect lighting. The doors face north, so they don't get any direct sun. But when we've had snow there's lots of reflected light from all the white surfaces out there. I don't like depriving them of lots of light, but I don't like to expose them to the bitter cold either. Life is compromise. Their water does freeze overnight if the temperatures are low enough. I've had to buy a second waterer can to have a spare one ready to go each morning. I swap them out, always keeping one in the sink in our unheated garage, which is warm enough to thaw the water overnight and have it ready for filling the next morning. Because the water needed to be shut off to the hoses and garage work sink, that means I need to make an extra trip each morning in order to clean and fill the waterer inside the house. I fill it with warm water, knowing that it'll take many hours to freeze, and that the hens will peck through thin films of ice to get at the remaining liquid. At this time of year, there's about a 50-50 chance that the water is frozen when I go out in the mornings. The girls don't seem any worse for the inconvenience, so I'm leaving it at that. As you can see, I totally went the easy route with the nesting box, which is really a plastic bucket. I got this idea from a picture on The City Chicken. It looked great to me, since the other option was to build a wooden box with a lid sufficiently sloping that the girls wouldn't decide to perch up there and poop on it. This is a lesson learned early with chickens: give them as few surfaces as possible to poop on so there's less to clean. The bucket was simplicity itself and the girls took right to it. I cut a piece out of the bottom of the bucket, which is now the back of the nesting "box," so that I can reach in and remove the eggs without needing to get inside with the hens. 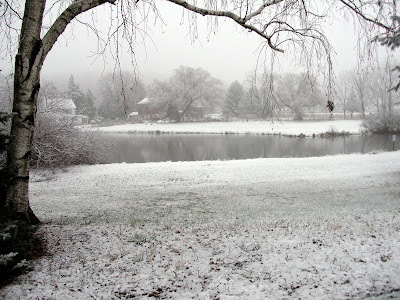 As winter deepened, the few green things that had held on through the fall chill were buried in snow. Very few fresh greens now to keep the girls happy. They really had enjoyed cuttings of the winter wheat cover crop my husband had sown along our south fence. Maybe that wheat will rebound in the spring, but right now it's not looking too good. Fortunately, I cut and dried quite a bit of comfrey during late summer, specifically for use as a winter time feed supplement. Wearing gloves to protect me from the prickles, I crush a handful or two of the dried comfrey into the sack of chicken feed every week. The girls get small bits of the comfrey with their grain feed. So far the color of the yolks still looks good. Not quite as deeply colored as when they're on grass, but still far better than store bought. We're just about out of the acorns I collected. The girls sure did enjoy them. I was most pleased that they could eat a few acorns every other day without any noticeable change in the flavor of the eggs. Jamon Iberico, the cured Spanish ham from pigs fed entirely on acorns was not to my liking, so I was a little worried that feeding acorns to the hens might result in off flavors. But none that we can detect. Collecting a lot more acorns for wintertime feed supplementation is going to be a fall project for next year. Keeping the girls in this way gives me more access to physical contact with them. I've started handling them every so often when I need to get into their enclosure. I'm surprised how easily they've accepted me picking them up for a few moments from time to time. Perhaps it helps that there's no urgency to me catching and holding them. I'm only trying to acclimate them to being handled, not trying to catch an escaped hen. I'm really not sure how I feel about this extra handling. It makes me a little fonder of them, and them a little more trusting of me. That may make things practically easier on me when it comes time to slaughter these girls, but emotionally harder. Though perhaps slaughter day will be less traumatic for girls used to being picked up and handled, so I suppose I could live with it being more emotionally difficult for me. We're getting lots of eggs from our girls, and they're of a good size too. That's the benefit of having young layers, though lighting them doesn't hurt either. At three or four eggs per day from this tiny flock of four hens, we had enough eggs to give away a few dozen as Christmas gifts. Chickens are definitely the "gateway" livestock. So easy to care for, so rewarding, and yes, they'll lead you to stronger stuff. 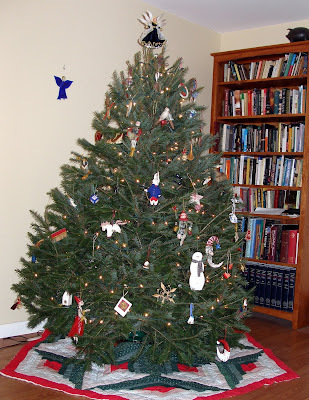 Post coming soon on the beekeeping equipment that was under the Christmas tree. I'm from a long line of people who have served in various branches of the US military. Though I never enlisted myself, I still benefit from my father's service in that I'm a member of USAA. This is a private banking and insurance agency that is known for top-notch customer service, and also for being run on a non-profit basis. As the child of a USAA member, I've always been eligible. It's one of the few military benefits that those who serve can pass on to their children. I've found it to be extremely worthwhile, since their homeowner's and auto insurance rates and policies can't be beat. I also use their totally, 100% free banking services. Anytime I have a question or concern, I can call USAA and quickly get a real, live, competant, polite human being on the phone to help me. I couldn't be happier with USAA, and I don't say that lightly. The reason I'm posting about USAA is that they recently changed their eligibility rules. It used to be that active duty military personnel could enroll anytime, and then there was a window of opportunity after discharge. After a certain amount of time had passed after discharge, you could no longer enroll, though the children of any USAA member could enroll at any time. Now USAA has opened eligibility to anyone who served honorably in any branch of the US military. If this applies to you and you're not a USAA member, I urge you to consider becoming one. We save a lot of money and hassle with the services USAA provides. We just got our auto insurance dividends, and next month we'll get our annual rebate from our USAA credit card. And yes, those checks arrive at a particularly nice time of year. Even if it didn't make obvious sense from a financial perspective to use USAA for our banking and insurance, I would seriously consider paying for their services just for the outstanding level of customer service they provide. The sweet thing is, we pay less for that service. A lot less. So if you or someone you know qualifies under the new eligibility rules, especially if that person is your spouse or parent, check out USAA. I would use any service they provide, with confidence that they would do right by me. I've sort of been on a cream-of kick. Soup has been much desired lately, and I've been wanting to highlight the root vegetables that are still available in the winter garden. 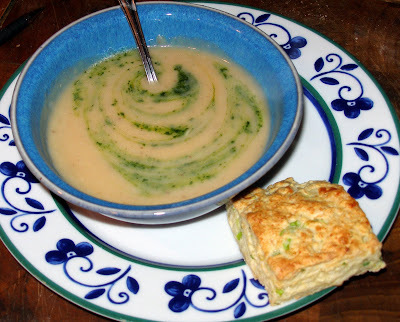 Cream-of soups do the trick and are so easy to prepare. We were taught in culinary school how to make cream-of soup out of just about anything. This time around, a predicted blizzard sent us out digging for parsnips. I had in mind a roasted parsnip soup. We dug up a little under two pounds of them as we waited for the storm to begin in earnest. 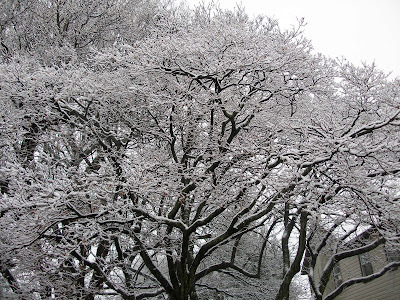 Despite the lower than freezing air temperature, the ground is not yet frozen below the surface. Digging the parsnips was pretty easy. After being cleaned the parsnips were roasted using a method I usually use for potatoes. I greased a large casserole dish lightly with butter, cut up the parsnips and laid them in the dish, ground some white pepper over them, sprinkled with kosher salt and then drizzled them lightly with olive oil. I tossed everything together with my hands to coat the parsnips evenly, then arranged everything evenly again in the casserole. To this I added about 1 1/2 tablespoons of water and then tightly covered the dish with a sheet of aluminum foil. Into a 400 F (205 C) oven for 35 minutes, and then the foil was removed. I put the dish back in the oven uncovered, and raised the temperature to 425 F (220 C) to let the roots brown up a bit. This took about 15 minutes. (Note that most of the caramelization (browning) takes place on the side of the parsnip in contact with the casserole. If you wait until the tops are browned, they'll probably be burned underneath.) Meanwhile, I was also baking two medium potatoes in the same oven. I waited until the vegetables were done before proceeding, but if you're in a hurry you can start on the next step as soon as the root vegetables are in the oven. I medium diced two medium onions (boughten) and sauteed them in butter with a pinch of salt until they became somewhat translucent, soft but not browned. Then I put the nicely browned parsnips, and roughly chopped baked potatoes (ours) into the pot and added enough chicken stock (ours) to cover everything and make the parsnips float freely (about 2 quarts). I also added a couple of cloves from a head of roasted garlic (ours) we happened to have around and two bay leaves (boughten). All this was brought to a gentle simmer and then the heat under the pan was reduced. I let it all simmer together gently for about 15 minutes. The next step is the one that's a pain. I fished out the bay leaves, then strained out the liquid from the solid ingredients, but reserved the liquid. Working in batches, I pureed the solids with a little of the liquid added back in to help everything blend up nicely. The puree and extra reserved liquid was returned to the pot. (I tried the pureeing step first with an immersion/wand blender. It didn't work.) 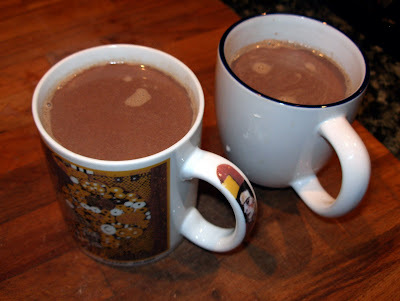 Then I added about 3/4 cup of whole milk (local) and tasted to adjust for salt and seasonings. I brought the pot back to a very gentle simmer and let it go for 5 more minutes. Each serving was garnished with a brilliantly colored slice of parsley butter (our parsley, boughten butter). It's a simple soup that tastes richly of sweet parsnips. Not something that will necessarily wow guests, but pretty satisfying as a winter harvest meal, and very warming on a chilly night. If I were feeling more adventurous, I might try adding a slice of fresh ginger during the initial simmer (probably best not pureed) or some freshly grated nutmeg. 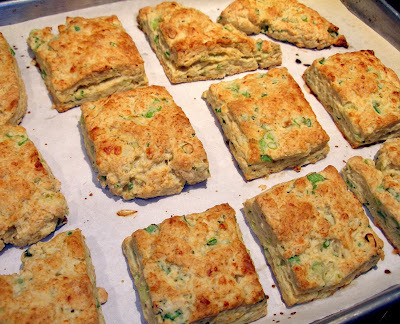 Moving on to the non-harvest part of our snowstorm feast, I also made scallion biscuits. Ceridwen asked for a recipe, so I'll go ahead and list one. But first, an absolutely necessary little digression into etymology. Blame Ceridwen, or skip ahead a bit if this stuff bores you. "Biscuit" literally means twice-cooked. The German word Zwieback, and the Italian word biscotti are cognates for the English word biscuit. But the Germans and the Italians actually mean what they say when they use their terms. Both Zwieback and biscotti are hard little farinaceous things baked once, and then sliced and baked again. The English word "biscuit" is an excellent example of the two nations divided by a common language. The Brits, when they use the term, mean what Americans call a cookie. Yet neither American cookies nor English biscuits are generally baked twice. When Americans say "biscuit" they mean something in the general ballpark of what the Brits call scones, and American biscuits are not twice-baked either. Americans eat their biscuits in a savory rather than a sweet capacity. In the US, biscuits are vehicles for ham, eggs, cheese, or gravy, usually showing up at either breakfast or dinner, where they are associated with heavy meals. Though Brits don't put sugar in their scones, they often slather them with jam and cream; and dried fruit might be included in the dough. Usually in the UK scones are associated with tea, rather than a full meal. (Please correct me if I'm wrong in this, British readers.) Americans on the other hand will bake scones with sugar in them or on top of them, but don't add jam to them after baking as commonly as the Brits. So to conclude, an American biscuit is pretty close to a British scone when it comes out of the oven, but not in the way it's eaten; a British biscuit is nothing like an American one; and a British scone may not bear much resemblance to an American scone. -There! I've had my foodie-word-geek catharsis for the day! Here endeth the lesson. Oh, and Ceridwen, I too was thinking of adding cheese to my scallion (green onion) biscuits (scones). I just hadn't decided which cheese to add. Preheat oven to 450 F (230 C) and grease a baking sheet or line it with baker's parchment. Sift/stir together dry ingredients. Using your fingertips, blend in butter very quickly until the mixture resembles coarse meal. Stop before you think you should, and try not to warm up the butter any more than really necessary. Stir in the scallions and grated cheddar. Add buttermilk and stir just until dough forms. Gather into a ball and knead on floured surface, gently, just 6 times. Pat dough into a square or rectangle. Cut into 9 (sorta) equal pieces (the corner pieces will probably be irregular - don't sweat it) and arrange them on your baking sheet. Brush the tops of the biscuits with a little extra buttermilk. Bake for about 12-15 minutes, or until golden brown on top. *Plenty of other cheeses will work here too. If you don't have cheddar, try whatever you've got. But firm, somewhat assertively flavored cheeses tend to do best. **If you have no buttermilk on hand, put 1 tablespoon of distilled white vinegar or lemon juice in a 1 cup measure. 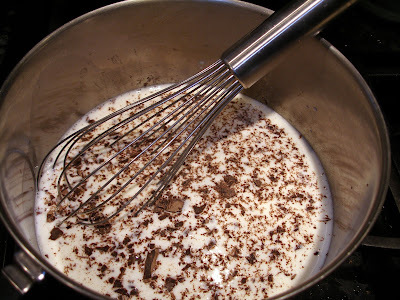 Fill the measure the rest of the way with whole milk, stir gently, and let the mixture sit for ten minutes before proceeding with the recipe. This makes just a bit more than is needed for this recipe. By the way, this recipe doubles well, which I strongly recommend doing if you've got a house full of biscuit eaters. They'll keep a few days at room temperature in a sealed bag, and you can freeze some if you need to. Fresh sage (in smaller quantities) makes an excellent substitute for the scallions. All in all, it's a pretty flexible recipe. Enjoy! I thought an in-progress report would be appropriate for my first home curing experiment. 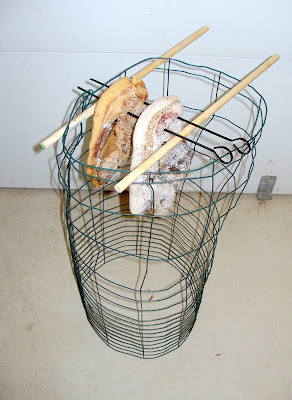 After removing the guanciale from the refrigerator, I succumbed to temptation and smoked one of them in my homemade garbage can smoker, with wood chips from our own apple tree. This is entirely inauthentic, and I'm not even sure I should continue to call that jowl guanciale. But what can I say? We like smoked pork products, and I thought a side-by-side comparison would be interesting. I smoked the one jowl for about four hours. The smoker was quite warm during that time, but not what I would call truly hot. The jowls have now been air curing for over two weeks. I rigged up a pretty crude hanging system in the unheated garage, using a tomato cage plucked from the garden supplies. I just wanted to make sure no critters could climb up to them. If rats were a concern, this simple design wouldn't cut it. But all we've ever seen evidence of in the garage is mice, and none lately. So this should be fine. I was surprised to find that the jowls started dripping again after bringing them into the garage. When they hung in the refrigerator, they lost enough moisture to drip for a day or two, and then stopped for three or four days. I suppose the slightly higher temperature of the garage changed things. Even with very low overnight temperatures, the garage has been consistently in the low- to mid-40's F. I keep them over newspaper so that salty meat goo doesn't fall on the garage floor. The smell of the jowls is nice. The smoked one obviously smells smoky and delicious. The unsmoked one has very little smell at all, just a faint meaty scent like what you'd get from a very firm hard salami. I can see that both of the cuts are getting smaller as they lose moisture. Unfortunately, I didn't weigh them before I started the curing process, so I have no idea what the figures are. They are also becoming noticeably stiffer as they cure. The plan is to let the jowls cure for at least two more weeks. After that, it's carbonara time, baby! I recently picked up a couple good sized hunks of Asiago-style grating cheese from a local grass-based dairy. I'd prefer a pecorino for carbonara, but I'll take what I can find in my own area. Since the cheese is so well aged, it'll hold for months in the refrigerator. Not that it's likely to last that long. I don't do roundups of stuff I come across in my online reading as often as I probably ought. But here's a collection of random stuff, some of it posted a while ago, that struck a chord with me. We're not from around here - If you've yet to acquaint yourself with Jenna Woginrich's gorgeous writing over at Cold Antler Farm, start here. She really knocks it outta the ballpark. The Onion is always good for a laugh whenever a cynical mood strikes. Here's why you simply must run right out and buy the new device. The old, repellent; the new must be bliss. Rob over at One Straw is looking for input on an awesomely ambitious project of developing a permaculture hoop house design that will produce food, fuel, and other resources solely from local inputs. Go on over, check out the ideas already tossed around, and chime in with a few of your own. Finally, this short film about the premiere Transition town in the UK, Totnes, recently lifted my spirits. We're hunkered down for a storm that should bring us several inches of snow over the next few days. 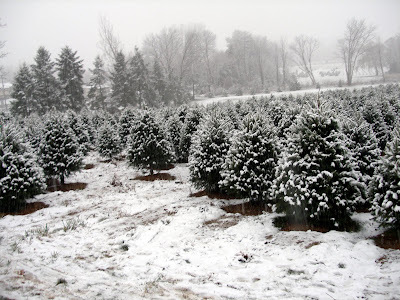 Maybe we'll get a white Christmas. Our supplies of bread and milk are laid in, and the chickens are laying very well despite the cold. I may have to make some scallion biscuits. Or a big pot of soup. Or maybe both. On Wednesday afternoon we put down our beloved cat. She'd had a good fourteen and a half years of life, all but a couple months of it with me, and was an inveterate mouser right up through mid-November. With three serious health strikes against her (kidney failure, cancer, and hyperthyroidism), I'm amazed she made it as far as she did. I'm grateful her decline was fairly swift rather than lingering. Though she carried complaint and plaintive protest to an art form, and was never a lap cat, when she was happy and cuddled up beside us, the world was a sunny and benevolent place. She was a bright spirit, The Cutest Cat Ever, and a melter of hearts. This, coming from someone who has been around cats for four decades. Whenever the day was a bad one, she made things bettery. It is always hard to put down a dear pet. As much as I miss her, I am glad - relieved in fact - that her decline is over. In a way the anticipation of putting her down was worse than dealing with the reality of her death. I'm surprised how very much it helps me to have the hens to care for. They are not pets. But they are in the prime of their lives, and they are happy, lively creatures. When we put our last cat down, we still had one remaining to distract us from our grief. Now our house is without a cat, and so can hardly be called a home. Although we knew the day was coming, and although we know that other cats will be a part of our lives one day, we exist now in a time of mourning. I don't want to rush to fill that space of loss. The bitter chill and the darkness of winter feel appropriate to our mood. Grief is the price of joy and loving and remaining alive. If I felt no pain, I would know that even if my heart still beat and I still drew breath, I would not be among the living. Life consists of both joy and pain; only that which is dead is beyond suffering. My periods of mourning for pets have been briefer than for people I have loved, but the grief is no less real or less deep. Goodbye, and go well on your way, Little Kitty. We will always miss you. Setting an explicit list of goals for myself seemed to work well for 2009. I didn't accomplish absolutely everything on my list. But it certainly kept me a little more motivated than I otherwise might have been. I'm also delighted with how much we got done that was never on the 2009 list in the first place. Since the list worked so well this year, I'm trying it again for next year. Here's a list of projects and some skills I want to work on in 2010. Start a Meyer lemon & a few fig trees in containers - I've come across a number of good tricks for growing fruit trees that can't normally survive winters in my zone. 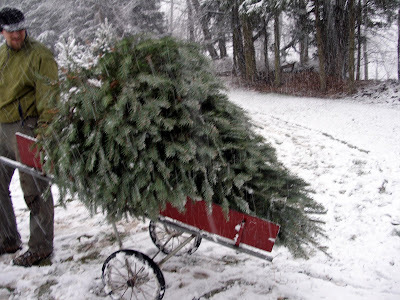 This generally involves planting in containers and bringing the trees indoors in winter, even if that means into an unheated garage. I especially like the tip about wrapping a lemon tree in Christmas lights for the nights when it gets particularly cold. Over the next few months I'll monitor the temperature in my detached and unheated garage so that I'll have a sense of just how cold it will get in there around this time next year. Make better use of shaded areas around the property - Soon I'll order ostrich ferns for planting next year. These are the ferns that are edible as fiddleheads when they first emerge. I'll also continue to propagate the ramps that are growing well in at least one shady spot on our property. There are several other shaded areas where they will probably do well. Both fiddleheads and ramps are early crops that will come up in the spring before much else will. Natural season extension. We're mulling the possibility of adding a blackcurrant bush under the large trees that shade our house or at the drip line of the apple tree. The shade might be too deep to see good production from a blackcurrant. Though if we thinned the canopy it might work. Much to think on for this goal, and I'd love to hear your suggestions. Plant more culinary and medicinal herbs - Since switching into serious gardening mode, I've come to appreciate the value of perennials more and more. In terms of self-sufficiency I've also begun to move beyond the low hanging fruit of food production and into the more challenging area of medicine. Herbs fit both categories. So this year I'll be adding several herbs to the mini homestead, including garlic chives, valerian, uva-ursi (bearberry), sweet cicely, evening primrose, St. John's wort, yarrow, and peppermint - in a container of course. I'm especially interested in perennial herbs that can tolerate some shade, in connection with the previous goal. Better fruit tree pruning this year - Last year I did only minor pruning on our old apple tree that should really have had major pruning. Like many spring chores, this is one that gets by us too easily. Add honeybees to the homestead and find a beekeeping mentor - 2010 is definitely the year for it. My only requested gift for the coming holiday season is beekeeping equipment. Though we may not harvest any honey in the first year, we should see improved pollination of our apple tree and garden plants. This should be an adventure and a serious challenge. Having an experienced beekeeping mentor is supposed to help enormously, so we'll seek one within the beekeepers association we recently joined. Load up on soil amendments in April and May - Every Saturday morning in April and May our township sells a front-loader scoop of either compost or high-quality mulch for a mere $5 to any township resident. The scoop is big enough to nearly fill the bed of our beater pickup truck. That's an incredible deal, which we took advantage of a few times this year. For next year, I'm making it a goal to be there for every one of those eight weekends for a $5 load. That means I'll need to stay on top of unloading the truck and spreading the soil amendments each week, but it'll all benefit my garden for a very low price. Create a master plan for the "perennial swath". This is an under-used (read: heretofore mostly ignored) area on the south edge of our property. We waded in far enough this past spring to plant two cherry trees and a few perennial herbs. The rocket stove was also built right on one edge of it and the blueberry bushes are on the other end. It got a major clearing out late this summer by my husband, who seeded it heavily with cover crops. I took one look at that big, newly opened swath and though "winter squash for 2010." But we need a master plan and a real weed suppression system here, preferably to involve perennials that will not require too much attention throughout the year. I've envisioned this as a quasi-forest garden area. But I haven't put in the time to think about it in detail. That needs to get done in 2010, even if we don't implement the plan until subsequent years. Add one or two Herbert blueberry bushes to my blueberry patch, and arrange deer/bird protection for the entire blueberry patch - 'Nuff said. Build a working space for the solar oven - A level, waist-high surface in a sunny area would make it much easier to use the oven, which is ideally turned a few times during the day to track the sun across the sky. Additionally I would also like a little bit of working space around my solar oven. This would let me take something out of the oven, set it down, and then quickly close up the oven again if there are other things still in there cooking. A "countertop" would also allow us to serve up right outside if we wanted to. Add more barrels to our rain catchment system and have the roof runoff tested - In an average year, we enjoy a generous amount of rainfall. So much so that I rarely water the garden once my plants are established. 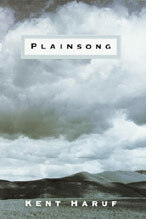 But droughts can happen here just as much as any place, and climate change is a wild card. I would also like a supply of water even if the electricity goes out, or if our ground water is ever contaminated. (We have our own well.) Setting up a rain barrel collection system just makes sense for so many reasons. The asphalt shingle roof on the garage is sufficiently old that I doubt there are any toxins coming from it now which we need to worry about. But testing makes good sense nonetheless. Get a hand pump installed for our old well - As an emergency water supply, this just makes sense. Create at least one permaculture guild around our fruit trees - We have a huge old apple tree and newer pear trees which could become part of the lawn eradication project. This is going to require some wintertime research on my part to be ready for spring planting. It's also going to involve a helluva lot of lasagna mulching. Build more cold frames and do more about season extension - My first (modest) success with a cold frame has left me very covetous of more cold frame space. We have more windows from old storm doors to use, and we have a good location to put them in. We just need to build boxes to fit them. We also need to put some thought into building a hoop house at some point. We could certainly be more diligent about season extension with just the row cover material we already have. Improve on 2009's total harvest tally - I'm not aiming for any specific number in terms of poundage. I just think that as our perennial crops mature and our experience grows, we should see some increase in the amount of food we harvest and glean. Since our tomato crop was nearly wiped out by blight this year, we lost out on at least 75 pounds of harvest weight which we should be able to count on in a better year. Take a more serious approach to gleaning acorns - The acorns from the oak tree that straddles our property line have proven to be a great favorite of our laying hens. I crush and feed a few handfuls to the girls every other day, and we are rapidly depleting the 25 pounds and change that I was able to collect from that one tree. I know of several oak trees in public parks and along pathways near the creek, and that's without having really scouted for them. I'm going to make it a priority to collect acorns from areas off our property next fall. At more than 1700 calories per pound, the feed value of this free natural resource is incredibly high. Not only will gleaned acorns reduce my feed costs, but it will help alleviate the fact that I'm feeding grains to my hens that could otherwise go to feed human beings. I won't set any harvest weight goal for acorns, but I'm going to try hard to make it a good haul. Figure out how to squeeze a couple "hazelbert" bushes in somewhere - Hazelbert - that's a hybrid of filbert and hazelnut, apparently more resistant to eastern filbert blight. We'd need at least two bushes for pollination and they get pretty large, so sufficient space is an issue. This may not be feasible unless we're willing to sacrifice one of the last few mature trees left in our backyard (a maple or a hemlock). Also, we'd have to fight the squirrels and jays for the nuts. But they're my favorite nuts and in due time they would be an excellent source of fat and protein. A perennial, low-maintenance, high-calorie crop is nothing to dismiss lightly. Take a first aid course and stock a first aid kit - On to our few non-food related tasks for 2010. I'm going to try to get this done very early in the year, before spring begins the round of gardening tasks all over again. Take a gun safety course, buy a gun or two, possibly get hunting licenses - My husband has been itching to buy a gun for a while now. I told him no dice until both of us had gone through a safety course and identified a range where we could practice shooting on at least a quarterly basis. Fortunately, as an engineer, he can't argue with the sensibility of these preconditions. But he's been too busy to make this happen so far. We have no children, which lessens my concern about guns in the home. On the other hand, I am home alone whenever he travels. So having a self-defense weapon that I actually feel comfortable with wouldn't bother me. That's the key though - I don't want a weapon of such power in our home until I feel completely confident that we both know exactly how to use it safely. Another item to cross off our list as early in the year as possible. Seriously consider buying an electric-assist bicycle - These are expensive, so we will need to see how our finances look by early summer before making any decision. I rode a bicycle as my primary means of transportation for 14 years. I did it, but didn't much care for it, since I had little choice but to ride in all weather, good or bad. Biking is not a form of recreation for me. Though we could bike to several of our most frequent errand destinations, the distances are not what I was formerly accustomed to, and the terrain here is quite hilly - also not what I was accustomed to at a younger age. An electric-assist bicycle would make longer distances, bigger hills, and heavier loads far less daunting to me. But I know this is a purchase that only makes sense if we really commit to using the bike instead of the car for a lot of trips. We need to give that as well as the finances some serious thought. Build an arbor for trellising edible vines - Of all these goals, this one's lowest on the list of priorities, since it falls, admittedly, more into the aesthetic side of things rather than the utilitarian. We'd like an arbor that will support both some table grapes and my husband's hops vines. I envision a couple of Adirondack chairs under a breezy, green-shaded arbor with a gin and tonic resting on the arm of each one. This is a long shot frankly, but that's why it's called a wishlist. Weelllll...I had hoped that all that we accomplished in 2009 would somehow make our workload lighter in 2010. But looking at this list I've compiled indicates it ain't going to be so. How does this happen? I think over this list though, and I delude myself into thinking that if all - or even most - of this got done, surely there would be few new projects to tackle in 2011. Right? Why are you laughing? What are your goals, resolutions, plans, dreams, aspirations, or wishes for 2010? Much of the time it feels to me like we're not making any progress on our goals. I don't know why this should be, because in fact we've made a lot of progress this year. Maybe it's because my task list is just so damned long that as soon as one project is done, another one immediately takes its place at the top of the priority list. Reading my favorite blogs does nothing to help shorten this list, by the way. But that baseless feeling of not making any headway is crazy-making - for me, and for anyone around me. (*Cough* Sorry, Honey.) That's part of the reason I decided to participate (sporadically) in Sharon's Independence Days Challenge. But lately I've been feeling the need to remind myself of the bigger things we've accomplished this year to move towards our goal of financial independence and food sovereignty. For the year as a whole we reduced the principle owed on our mortgage by $35,355, and my husband managed to remain employed despite the recession. We also harvested (so far) just shy of 600 pounds of produce from our backyard garden, worked mostly by myself alone. This doesn't include food that passed from hand to mouth without ever making it inside, nor garden vegetables deemed unfit for the table but good enough for the chickens. Given that it was an execrable year for tomatoes and apples, and a not so great one for potatoes, this harvest tally makes me pretty proud. And there's more out there to keep harvesting. I preserved a great deal of these homegrown and some gleaned foods - with varying degrees of success - by smoking, dehydrating, canning, curing, lacto-fermentation, and freezing. January: Can't remember much. I think I hibernated most of the month. Got the seed and rootstock orders in, grouping them with friends to save on shipping costs. February: I made some worm bins and got our vermicompost system going, bartering for the worms. Attended the PASA conference where I learned a lot and met some local gardening folks who are becoming friends of ours. March: We expanded the tilled area of our large garden from around 1700 square feet to about 2000 square feet. Removed ornamental trees to make room for fruit trees and berries. Dealt with the debris. Husband ripped out large patch of forsythia to make room for more perennial edibles. April: We had an energy audit done on our home. Built permanent raised beds for asparagus root stock, making use of a narrow space behind the shed. Planted many perennial food plants, including cherry and pear trees, asparagus, raspberries, blueberries, elderberries, and grapes. Renovated and improved our mobile chicken pen and coop. Started numerous seedlings inside. May: Added a significant quantity of free compost and mulch to our annual garden bed. Got much of the annual garden planted. I added several perennial herbs for culinary and medicinal uses. Baked and froze enough bread to supply us through the hot months of the year. June: We built a rocket stove and continued planting, despite the horrific rainfall. July: Following up the energy audit, my husband added some insulation to the attic. I worked on air sealing with silicone caulking around window frames. Learned how to slaughter our old laying hens. Built and used a homemade chicken plucker to help speed the processing. August: Learned how to salvage potatoes when the plants got the blight. Built our first cold frame with salvaged materials and planted it. Set up our first rain barrel. Added a gutter to the back of the garage, (well, had one added) where roof run-off had made for a very damp patch of yard. September: Finally made a token effort towards learning how to sew. Eradicated new portion of the lawn and lasagna mulched in preparation for garlic planting. My husband made substantial progress on turning a corner of our basement into a root cellar. Got our so-designated "perennial swath" substantially cleared and sown with cover crop. Finally had some of the black cherry wood cut down last year milled into lumber. Began harvesting acorns to supplement purchased chook feed. October: Slaughtered our second batch of low-producing laying hens. Harvested potatoes and some apples. Had our basement walls insulated and the house air sealed. Had conduit installed for a future passive solar thermal and possible photovoltaic arrays. Planted garlic, including a new softneck variety and four hardnecks from our own seed stock. November: Lasagna mulched several new areas for spring planting. Put the garden (mostly) to bed for the winter. Harvested and pressed apples into cider. Organized much of our stored food on shelves in the newly insulated basement. Arranged to teach an introductory homesteading class in the spring. Attended an introductory beekeeping class, as well as a meeting of our local beekeeping association; became members of that beekeeping association. Did some tree trimming of branches which shade a significant part of the garden in summer. Made (a little) more progress on the sewing competence front. Had our radiant heating system extended to our kitchen in preparation for converting to passive solar heating. Started building winter housing in the shed for the hens (and possible future meat rabbits), including a timer on the fluorescent lights. Used homegrown fruits and vegetables for every dish we contributed to the Thanksgiving feast. Began curing pasture-raised pork jowls as guanciale, a sort of Italian bacon. December: Put the finishing touches on winter quarters for the hens and moved them into a converted corner of shed. Sourced a local, grassfed prime rib roast for our Christmas dinner. Do self-sufficiency crimbo gifts also count? I asked for beekeeping equipment for Christmas. Working on a roster of self-sufficiency skills and projects for 2010. (Post on that topic coming soon.) Inevitably, I'm already feeling the pull of planning mode for next year's garden. Wow! Writing it all out like that really forces me to acknowledge that we did accomplish a lot this year. We have made progress. No wonder I'm tired! I don't mean to brag here, nor to make anyone feel that I'm some sort of uber-green super-achiever. Far from it. It's just that sometimes I have an overwhelming sense of urgency that makes me feel like we're way behind the curve. For my own sanity and domestic tranquility, I need to remind myself of these milestones occasionally. I would love to hear about the milestones you passed this year. Please consider posting about them on your own blog and leaving a link in the comments here. If you have no blog, then please share the accomplishments of this year in a comment. It took a while, but winter is really here. Temperatures will drop well below freezing overnight and there are no daytime highs much above freezing anytime in our 5-day weather forecast. I've sort of been waiting for these days. Today it was finally time to dig up a few of the new vegetables I trialed this year. Despite the cold weather, the ground isn't the least bit frozen yet. I know, harvesting in December in Pennsylvania sounds unlikely, but there are so many possibilities with season extension. My main strategy is the laziest one: just grow things that mature late and don't mind the cold. 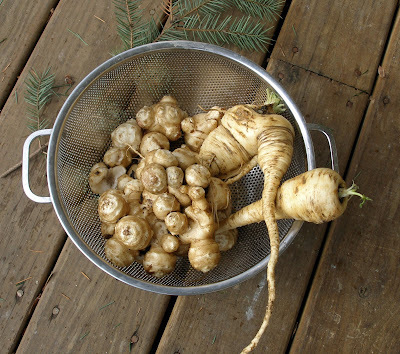 Such as Jerusalem artichokes and parsnips. Both of these crops take up garden space for a very long time. From the perspective of overall production efficiency of the garden neither crop makes a great deal sense, since they don't fit into any succession planting scheme. But I really like roasted parsnips. And being able to harvest through the cold months of the year is important to me. So I'm willing to give parsnips the space and time they need. Jerusalem artichokes on the other hand were a complete experiment. I didn't even know whether we would enjoy eating them. The selling points on these tubers included their ability to thrive on utter neglect, their ability to hold in the ground until I'm ready to dig them, and a reputation for large yields. The liabilities included a reputation for causing "hellacious" gas and for being ineradicable once established. Apparently some people can digest inulin, the main form of starch in Jerusalem artichokes. Other people can't, and their intestines let them know about it. What fun to conduct an experiment on ourselves! I thought about making a Jerusalem artichoke and parsnip soup, but then thought it would be wiser to let the unfamiliar vegetable take center stage, the better to judge the reaction of both tongue and alimentary canal. I did however see fit to muddy the water just a little bit with some of our La Ratte fingerling potatoes. Not being a particularly assertive flavor, but contributing a starch well known to our intestines, potato seemed like a good compromise. I put in maybe 1/3 of a pound of potatoes to 1 pound of Jerusalem artichokes, and didn't peel either vegetable, just scrubbed them very well. On a hunch, I boiled the Jerusalem artichokes slowly in a separate pot from the rest of the soup, hoping the cooking water might leach out a bit of the potentially offending starch. Otherwise, the soup was pretty straightforward - garlic and leek sauteed in butter; then salt and pepper; potatoes cooked together with the rest in chicken stock to cover; the separately cooked Jerusalem artichokes added in; everything pureed with a wand blender; cream added, and topped off with a garnish of chopped parsley. Everything but the salt, pepper, butter and cream were produced on our little sub-acre suburban lot. Gosh, it was tasty! Very simple, but tasty. The appearance, frankly, was not very prepossessing, though that could probably be overcome if purple potatoes or some fancy-schmancy garnishing tidbit were used. The tubers really do have the flavor of artichokes, despite not being at all closely related to them. I could see going in several different directions with spices and vegetable pairings for Jerusalem artichokes. I think they would partner very well with spinach for instance, but I'm also curious about adding a faint note of either fennel or star anise. I had a small bit of this soup for lunch, then more for dinner, and thus far no intestinal distress. So I think I'm in the clear. And there are parsnips to look forward to with tomorrow night's dinner! 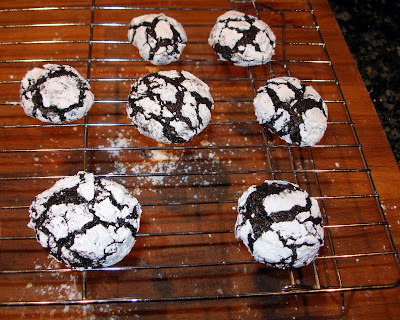 There were a couple of recipe requests for the Chocolate Crinkle Cookies shown in my last post. So here 'tis. These are not cookies that you can whip up from start to finish on a moment's notice. The dough must be chilled rather thoroughly before baking. Most recipes you find for these cookies if you just google for it will tell you to chill the dough for three hours before baking. That's certainly a good start. But to get the full effect of the dramatic appearance of these cookies, there's an essential extra step; one that's little mentioned in the recipes I've run across either online or in print. After chilling the dough, I scoop the dough onto a baking sheet and freeze the dough solid. Once the dough is frozen, these do indeed become spur-of-the-moment treats. You can put the frozen chunks in a plastic bag and then reach into the freezer for however many cookies you feel like baking at a time. The dough will keep for two months in a frostless freezer, longer in a chest freezer. But read the recipe below carefully if you want the cookies to turn out as beautiful as they are delicious. Scoop the dough using a small ice cream scoop or two tablespoons, forming rounded balls of dough. Arrange them, tightly spaced, on a baking sheet and freeze them until solid. Remove the frozen cookie dough from the baking sheet, place them in a plastic bag, and keep frozen until you feel like baking some. Bake the cookies for about 10-12 minutes. They will expand as they cook, producing a festive cracked appearance. Bake just until the chocolate areas of the cookie lose their very wet sheen. They should still be fairly soft, though you can bake them longer if you want to produce a crisper cookie. The softer version of these cookies will fall slightly after being removed from the oven. Allow the soft version to rest for three minutes before removing to a cooling rack. Get the crunchy version off the baking sheet as soon as they're out of the oven. The yield from this recipe depends very much on the size of the cookies you make. I typically double this recipe and end up with about four and a half dozen medium-sized cookies. This is a dairy-free vegetarian recipe, so I believe they can follow any meal in a kosher household. Although very easy to prepare, they also draw lots of remarks in a holiday cookie exchange. I hope you enjoy them! Over the Thanksgiving holiday I saw lots of relatives that I see only a few times per year. One of them is a cousin of whom I've always been very fond. He's just a little younger than me, with a wife and a young daughter. He lives in Ohio, where the economy has been pretty badly damaged over the last 18 months. My cousin is a good guy - unassuming, hard-working, sweet-natured, and solid. He takes a back seat at lots of family gatherings among the more common strong personality types that make up the bulk of my extended family. For some reason, he always thought of himself as "not college material." I have no idea where this came from as he's far from dim-witted and a college education is pretty universally expected in my clan. But for whatever reason, he never got a degree. Now he's a general handyman, though unlicensed. He's a conscientious worker and skilled at what he does. But he's also self-employed and has hardly been raking in the money, especially since the downturn in the economy. Fortunately, his wife's a schoolteacher, so I assume they have good benefits and a reasonably secure if not lavish income stream. They're getting by better than others in their neighborhood, which has homes in foreclosure. What shocked me was hearing that my cousin and his wife are carrying a partial balloon mortgage on their home. The thing that left me nearly speechless was to realize in the course of this conversation that my cousin still didn't really understand what a balloon mortgage is or how it works. He and his wife had only a ten percent down payment on their home, and since he was self-employed, they couldn't get a standard 30-year fixed mortgage for the full amount they needed to borrow. A relatively small part of their purchase price, the other 10% that would have made up their 20% down payment, was supplied by the balloon mortgage. He said that when it came time to sign the papers for that loan his questions weren't adequately answered and the loan officer glossed everything over, making it sound like a typical arrangement that "everyone was doing." They signed without clearly understanding what they were committing to. I simply didn't know what to make of this. I was shocked that he had gotten himself into such a situation. It was hard to fathom my cousin and his college educated wife signing on the dotted line for such a large amount of money without insisting on a clear explanation of the fine print, let alone that he still didn't fully understand it a few years into the loan. I'm no financial expert, but I explained as best I could how balloon mortgages typically work. I'm pretty sure there's some variation even among balloon mortgages, and I didn't want to pry for any more details than he'd already provided, so I could only give him a general sense of what he'd agreed to. He appreciated the explanation, but he also seemed worried. Understand, my cousin doesn't have an extravagant home. For where he lives, and the time that he bought (mid-2006, just before the peak), he paid the going rate for a middle of the road, middle-class home. It was even a bit of a fixer-upper that looked improvable to them based on his handyman skills. Also understand that while I think he was somewhat taken advantage of by the mortgage broker, I also think the ultimate responsibility was on him and his wife to understand what they were agreeing to. There was no gun to his head when he signed. I worry for him and his family. They're good, responsible parents raising a beautifully behaved and articulate four-year-old daughter. They're living a typical American family life; they're not greedy, self-indulgent bastards, though perhaps a little foolish or too trusting. They don't run out and buy the newest toys. They dress themselves and their daughter in simple, functional clothes. Now, it seems to me, they're walking a tightrope. If his wife were to somehow lose her job (and she came close not long ago in a school district reorganization), they'd have no health coverage and would (I'm guessing) be unable to make their mortgage payment after a short time. If he were unable to work due to injury or illness, things would probably be incredibly tight. And that balloon mortgage is out there, looming in the distance. I think in many ways they're typical of a lot of American families. I don't know the details of their finances, but I fear it would take very little to tip them off the tightrope and into a downward spiral. I look at them and think that they could have been more careful, more cautious. But I also look at them and wonder why it is that such ordinary people, with ordinary, run-of-the-mill ambitions should have to look out for their own interests so carefully in this society. Even fifteen years ago, my cousin wouldn't have gotten a balloon mortgage. He might not have gotten any mortgage at all with only 10% down, his self-employed status, and his wife's teaching salary. A conservative, responsible banker would have told them to come back when they had 20% down. And knowing my cousin, he would have been fine with that. They'd have rented a bit longer. Maybe his daughter wouldn't have had a little backyard to play in for a few years. He would have saved that money up and eventually they would have bought a home. But in 2006, not being especially savvy, they did what they were told "everyone was doing." The kicker is, while that mortgage broker wasn't being completely honest, she wasn't lying either. A lot of people were doing it, and that made it seem safe enough. It just makes me sad that it was so easy for my cousin to make a bad decision that could really come back to haunt him, and to know that there are thousands of families out there in the same situation. I picked several pumpkins about 5 weeks ago which weren't fully ripe, leaving several inches of the vine attached to the stem. Somewhere on these intertubes I'd read that partially ripe pumpkins can be finished off inside on a sunny windowsill this way. So I thought I'd give that a try. I'm happy to report that all but the smallest and greenest of those pumpkins now look fully ripe. We don't have great southern exposure from any window in our house; too many large shade trees that screen the light, even with bare branches. So the pumpkins ripened very slowly. But they did ripen. These underripe pumpkins I was able to salvage just about doubled our total pumpkin harvest. Just thought some of you might like to know this trick for next year. 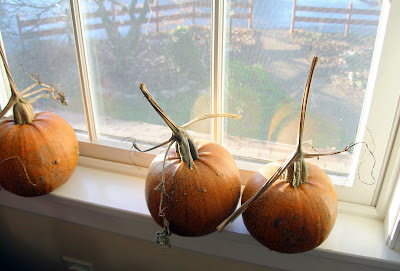 Now to move the ripe pumpkins to the coolest room in the house. They like to be stored around 50 degrees F (10 C). Let me tell you why it pays to know your farmer. That farmer friend I've mentioned a few times? The one who raises her animals on pasture, including our Thanksgiving turkey, and who occasionally throws some bones my way for free? She called me up on the Friday before Thanksgiving to ask if I wanted some random pork bits. Seems a few of her customers that bought whole or half hogs didn't want some of the less choice cuts, even though they had paid for the entire animal. So I was being offered pork jowls, organs, and possibly some other trimmings or offal as well. Of course I thought of Hank, and of course I said I was interested. My policy is not to turn down free handouts unless what's being offered would really present problems. Free pasture-raised local pork does not present any problems. The need for a little research, yes; problems, no. We got to the butcher's shop on Sunday morning. It wasn't clear exactly what bits were unclaimed, and it was clear that the butcher would put whatever he was permitted to keep into scrapple or headcheese, and render down any fat into lard. Not being a paying customer, I didn't want to seem too acquisitive. I left with two pork jowls, a liver, heart and a tongue. We're headed into the perfect time of year for curing meat - the dry, cold months of winter. And I've long wanted to try making my own guanciale (say: gwan CHA lay) - cured pork jowls prized in southern Italy and eaten like bacon. It's the authentic ingredient in several traditional pasta sauces, including spaghetti alla carbonara, for which I've always substituted American bacon. Traditional carbonara only has a handful of ingredients: eggs, garlic, cured pork, black pepper, noodles, and a good aged grating cheese. We produce our own eggs and garlic. I can get a surprisingly good grating cheese locally made from pasture-raised raw milk. Being able to source locally and then cure pork jowls into guanciale, and therefore to prepare a truly local carbonara or Amatriciana would be nothing to sneeze at. So starting about ten days ago I embarked on my first home curing project. I cannot tell you how thrilled I was to trim out a pair of hog jowls, scatter a mixture of salt, sugar, black pepper, other spices and some herbs from our garden over them, weight it all down in a bowl, and stash them in the fridge. I felt like the cat that ate the canary, with a free pork experiment in the fridge. It almost didn't matter how it turned out. Almost. As the meat sat in the salt-sugar mixture over the past week, it released a fair amount of liquid which I poured off from time to time. I added some more of the curing mix and turned the jowls over each time I did this. After just over a week I took the meat out of the bowl. It had a noticeably stiffer feeling than when I first salted it. I reapplied the curing mix wherever the meat seemed to need it, and hung it up in our refrigerator to begin the drying process. 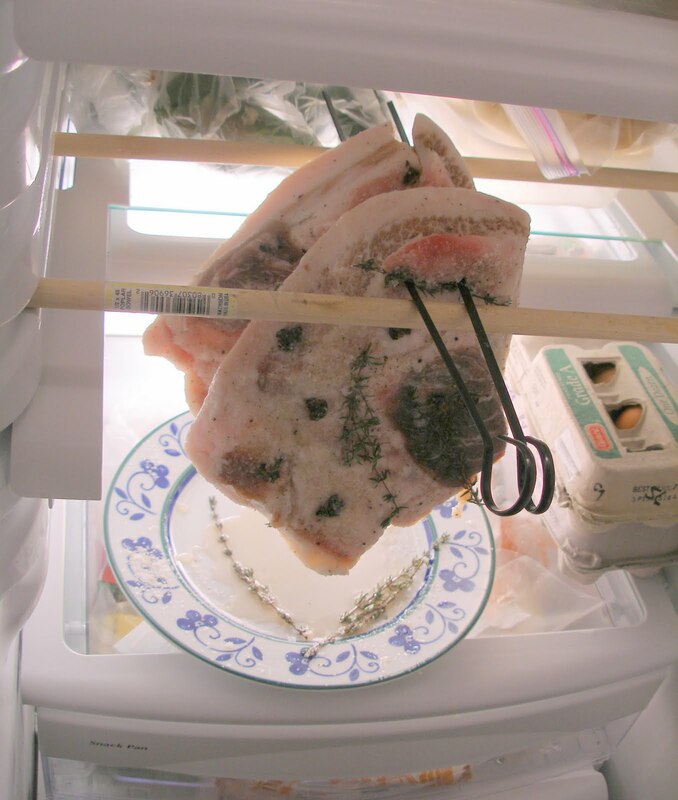 I managed the hanging by cutting up a wooden dowel into two pieces to fit in the shelf supports inside the fridge, and then piercing the jowls with two metal skewers which rest across the dowels. I've got a plate underneath to catch any drips as the drying process begins. Fortunately, my husband is away on a business trip, so it's only me rummaging through the fridge this week. I plan to find a place to finish the curing process in our garage after he gets back. That will allow the outdoor temperatures to settle a little more fully into true winter, and let me monitor the beginning of the drying stage quite carefully. 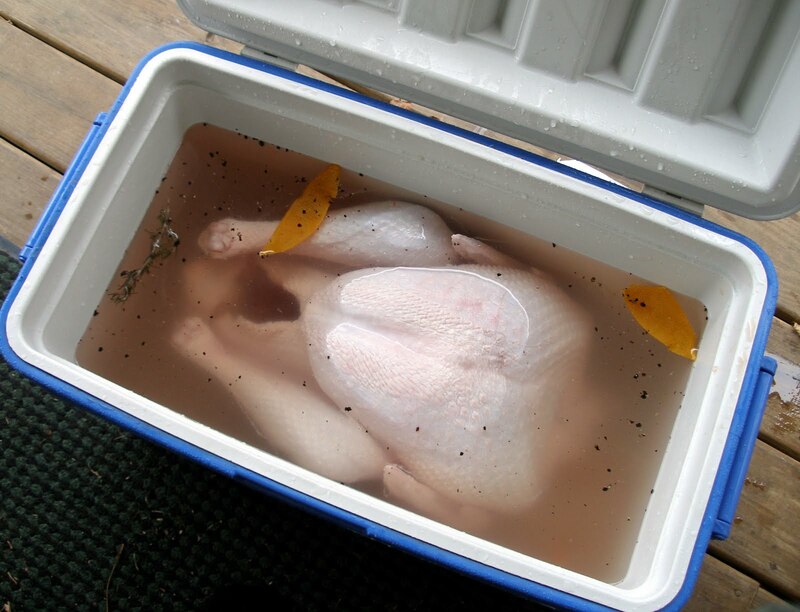 If there's any risk of spoilage, it would be right now, when the meat is out of its brine but still pretty moist. So starting the drying process in the refrigerator seems like a good compromise. All told, the guanciale will probably dry down for 4-6 weeks. The organ meats were a little more challenging to deal with. I have not been a fan of organ meats over the years. The whole idea of eating a chunk of flesh designed either to clean the blood or produce urine somehow lacks a certain appeal. But I'm trying hard to cure myself of food prejudices, and this is certainly an opportunity to put my resolve to the test. I like haggis, so I'm trying to work my way into things from that angle. Hank recommended an Umbrian sausage called mazzafegati, and a dish of pounded pork heart schnitzel with spaetzle. Those Germans, Italians, and Spaniards, good pork eaters that they've been over the centuries - they're the ones who would know how to eat everything but the squeal. Both of Hank's suggestions sounded good to me, but I didn't have time to deal with making them in the days leading up to Thanksgiving. So all the organs got thrown in the freezer. When I get hold of some pork fat and regular pork to bulk out the liver, I'll take a stab at that mazzafegati. And yes, I'll keep you posted on such efforts, as well as how the guanciale progresses. Wish me luck in my new food preservation endeavor! It's time for another monthly Action Item, and I can tell you I'm glad to wind up this project for the year. 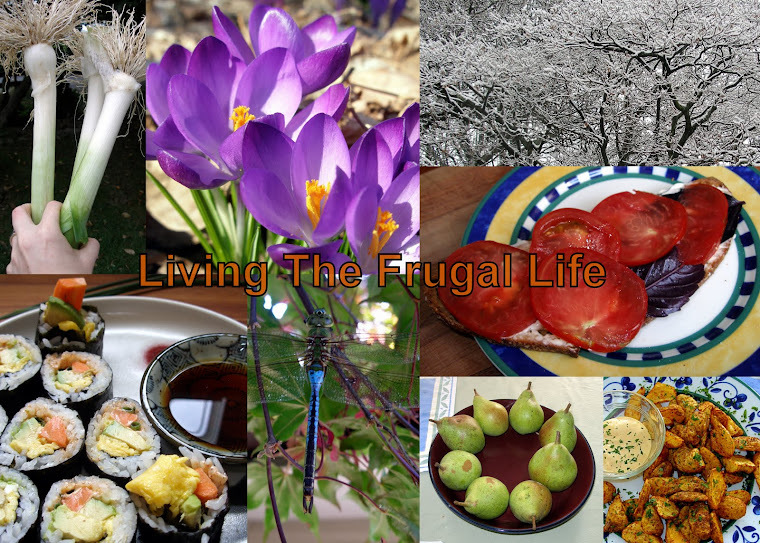 While these posts have been fun for me, it's also been a challenge coming up with frugal ideas that work for nearly everyone. I hope they've been of use. Those of you who read here regularly could be forgiven for considering this more of a gardening blog than anything else. What started for me as a clearing house for all the aspects of frugality in my life has evolved into something that is pretty heavily focused on the food we produce for ourselves on our little suburban lot. Given the degree to which my life revolves around food, this doesn't really surprise me, much as I'd like to be more well-rounded in what I blog. Yet oddly enough, gardening hasn't featured in any of my monthly Action Items thus far. Time to change that. December is a good time of year to start thinking about next year's garden if you're in the northern hemisphere. In many ways this is the point in time when the garden is in a state of absolute perfection - when it exists as a Platonic ideal solely in our imaginations. If you're not already on mailing lists for seed catalogs, you can check out several good seed vendors online. I recommend Fedco, Johnny's, Seed Savers Exchange, and High Mowing Seeds. I particularly recommend the printed Johnny's Seeds catalog to those new to gardening. Even if you don't end up buying anything from Johnny's, the catalog is a great resource for information about sundry garden plants, and they also have an excellent selection of tools. Those of you with a backyard lawn: I challenge you to convert at least 100 square feet per family member into a productive food garden. You can grow an awful lot of food in a 5' x 20' bed. 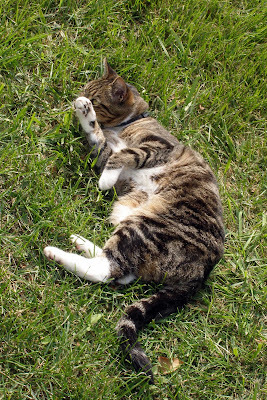 If you're in a sufficiently mild climate it's not too late to begin prepping such a bed right now with the lasagna or sheet mulching method: kill the grass, add compost or other soil amendments, cover that with heavy wet layers of newspaper or corrugated cardboard, and then cover everything with a layer of mulch. Those of you without a lawn but who have a balcony, bay window, a front porch, or even a segment of unused driveway can think about container gardening for next year. So that you don't need to buy expensive containers in the spring, start looking around now for food grade buckets. Delis and bakeries often have buckets of various sizes that held olives or other foodstuffs. These can be had for free by asking around, poking around dumpsters, or placing a wanted ad on craigslist. Once you've got them, drill a few holes for drainage. If you don't already have a compost pile, put the bucket outside and start chucking your kitchen scraps in there all through the winter. They won't decompose much during the cold months, but it'll give you a head start on material for the new year. If you've got a fence with hardly any soil you might consider heavily amending the soil right at the fence line and then growing pole beans up the fence. Beans aren't too particular about the soil they grow in and will generate their own nitrogen fertilizer from the air. The plants will twine around the supports and put their leaves on whichever side of the fence gets better sun. Just be sure you have access to get to your harvest. A wide variety of plants can be grown in containers, either pots that sit on the ground or those that hang from a hook. Tomatoes will thrive in containers against brick walls that bake in the sun, provided they're kept well watered, and they do pretty well in hanging baskets too, as do cucumbers. We did pretty well with container-grown potatoes this year. Thomas keeps a gorgeous lemon tree in a modestly sized container in his New England home. If you're really and truly deprived of any suitable space in which to place large growing containers, then consider a few small containers for greens, green onions, or herbs. A south facing window or two with good exposure can supply you with enough lettuce for salads or sandwiches for much of the year. Herbs are great to have on hand right when you want them, without even having to step outside. It's pretty amazing what some determined people have been able to grow in window boxes. If your home doesn't even have a south facing window, then you can grow your own sprouts on your kitchen counter. Fresh sprouts take very little tending, and provide an incredible nutritional boost to your daily diet. When people come to visit you in your dark abode, you can proudly show off your countertop garden. Work with what's possible and always push that boundary. If you're a determined type with no gardening space, then I would encourage you to seek out opportunities to grow on land you don't own. 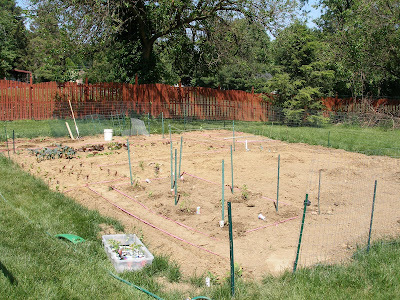 Community garden plots (US) or allotments (UK) are available in many urban areas. This time of year is a good time to put yourself on a waiting list for some space to grow if you're not already on one. Alternatively, you could pursue a garden-share - an option that many Transition initiatives are encouraging. Find yourself a neighbor with an under-used backyard and ask permission to use it to grow food. The best advantage in this arrangement comes when the homeowner is elderly or incapacitated, but would still love fresh produce from their own property. If you have the motivation to grow healthy food you could help not only yourself but also your landowning neighbor by splitting the harvest with them. Many elderly people who can no longer raise their own food remember well the value of a home garden. They remember an era when thrift was far more the norm than it is today, and would be absolutely thrilled to see their small piece of land put to good use. So don't let social shyness hold you back if there's a nearby property that would work for you. The worst that could happen is that the answer is "no." More likely, your request will be a blessing in someone's life. Alternative Action Item: If you're already an experienced gardener, then I'm sure there's no need to encourage you to think about next year's garden. You're already getting those seed catalogs in the mail, no doubt. So instead I'm going to challenge you to expand your gardening project in some way. Perhaps you have never bothered with perennials. That's a good direction to expand in - many years of harvest for one season of planting. Or you could work on turning some of your shade areas to production and simultaneously extending your season on the early side with early crops such as ramps and fiddlehead ferns. 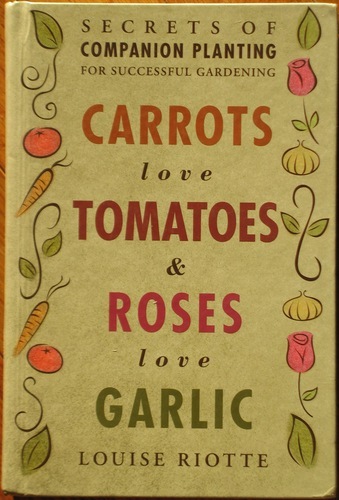 Perhaps you could concentrate on learning the basics of seed saving this year. Do a little research on some plants that don't cross-polinate very well and find out how to store them. Think about extending your harvest through succesion planting or row covers for use in the cooler months of the year. If none of those ideas appeal or you're already doing all those things then perhaps you could plant a row for the hungry this year and aleviate the strain on your local food bank.